Talk to your doctor if you experience complications that interfere with diabetes mellitus, including hair loss. Hair loss that occurs in the arms and legs is very important to report because it can be a sign of poor blood flow. If you have a history of diabetes and experience hair loss, you may need to adjust your diet, lifestyle, or medications to control your blood sugar to make it better. Usually, after blood sugar can be controlled, the hair loss that you experience will decrease. Yes, the amount of hair falling tends to be less and your hair will grow back. Here are some other ways to keep your hair fertile and dense and reduce hair loss due to complications of diabetes mellitus. Your doctor may prescribe hair growth remedies such as Minoxidil (Rogaine) that you can rub onto your scalp and other areas where there is hair loss. Men can also use a pill called finasteride (Propecia) to regrow hair. Finasteride has not been approved for women to use. If alopecia causes your hair to fall out, your doctor may prescribe steroid drugs to reduce inflammation. Biotin is a vitamin found naturally in foods such as peanuts, almonds, sweet potatoes, eggs, onions, and wheat. People with diabetes may have lower than normal biotin levels. 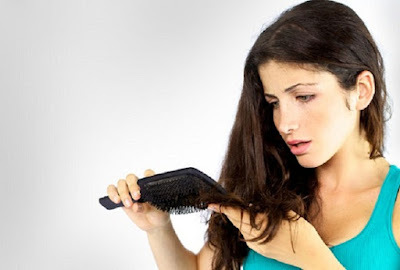 There is some evidence that taking biotin supplements can slow down hair loss. Consult your doctor first regarding the use of biotin. The recommended intake for adults is 30 mcg/day, but biotin supplements usually contain a much higher amount of biotin. Ask your doctor how much is safe for you. If hair loss covers a large enough area of ​​the scalp, you might want to cover it temporarily with a wig or toupee. The cost of using a wig is fairly cheap, and you can remove your wig when you no longer need it. Losing hair can be a scary thing for you, but the good news is that you have a choice. To manage your blood sugar, it is also important to do daily exercise. This is a great way to reduce blood sugar and encourage the delivery of oxygen to your body's organs, even your scalp! Consult with your doctor to learn more about what you can do to deal with your hair loss due to complications from diabetes mellitus. 0 Response to "How to deal with hair loss due to complications of diabetes mellitus"